New recordings of Shostakovich’s Fifth are always cause for celebration. True, neither of these conductors is a household name, but from what little I’ve heard of them they’re well worth investigating. 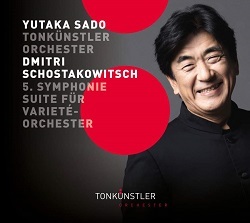 Yutaka Sado made a very good impression with a blistering account of this symphony, recorded live with the Berliner Philharmoniker in 2011 (Euroarts). As for the NDR Elbphilharmonie Orchester and their principal guest conductor, Krzysztof Urbański, they caught my ear with a refreshing all-Rachmaninov album, with pianist Anna Vinnitskaya a thoughtful and engaging soloist (Alpha). Of course, there’s plenty of competition in this, Shostakovich’s most recorded symphony. Among the most satisfying Fifths I’ve reviewed in recent years is Andris Nelsons’ Boston one, part of an ongoing cycle for Deutsche Grammophon. Not as visceral as Sado and the BP, perhaps, but he looks beyond the work’s public clamour to uncover a score of remarkable intensity and interest. Then there’s Leonard Bernstein and the LSO, filmed at the Royal Festival Hall in 1966 (Euroarts). A riveting portrait of the conductor at his best, that DVD is a must-buy for all Lenny and DSCH fans. I’d be happy with any of those versions, or with most others in my collection. However, two years ago I came across Kurt Sanderling’s 1982 recording with the Berlin Symphony Orchestra, remastered from the original Eterna tapes (Berlin Classics). 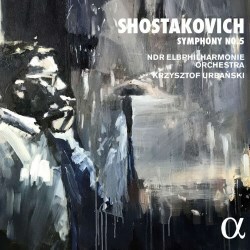 The conductor was a close friend of Shostakovich’s, so it would be perfectly natural to expect a unique perspective on this oft-played opus. But nothing prepared me for this revelatory performance, by turns deeply personal and profoundly moving. In my experience, no-one has ever revealed so much of the man behind the mask, or shown this to be such a complex, multi-layered work. I’m going to reverse the order of play and start with Urbański’s Fifth, not least because it turned out to be so intriguing. Ostensibly the composer’s response to ‘just criticism’ following the Lady Macbeth debacle, the piece is clearly more despairing/defiant than contrite. Indeed, it’s a constant struggle between outward gestures and inner turmoil, a dichotomy that Sanderling understood so well. On first hearing, I thought Urbański’s Moderato too subdued, its tensions diluted. Still, the climaxes come across with a thrilling stoicism that seems entirely apt in this unusually dark, rather moody context. Despite my initial resistance to this seemingly under-characterised opener, I yielded to it second time around, as, indeed, I did to the performance as a whole. The lower strings dig really deep in the Allegretto, although the conductor’s unhurried approach, with its focus on fine detail, won’t please everyone. That said, a distinct, very individual pattern starts to emerge; into this fits a drained Largo, its spectral pluckings more unsettling than ever. Also, there’s an impeccable, even irresistible, logic here that brooks no argument. The darkly cumulative effect is enhanced by warm, beautifully nuanced playing and sound of rare transparency and colour. And while Urbański’s Allegro non troppo is normally aspirated, rather than turbocharged, it’s no less thrilling for that. Even though there’s plenty of unexpected detail, especially in the woodwinds, he builds to a powerful and proportionate close. I’m pleased I persevered with this one, as it’s a very thoughtful take on a piece that deserves more care than it usually gets. So, not a ‘traditional’ Fifth, and not in the same league as Sanderling’s, but it will reward the patient and receptive listener. A filler would have been welcome, though. I first heard the Austrian Tonkünstler Orchester, of which Sado has been principal conductor since 2015, in a marvellous recording of Bernstein’s Mass, directed by Kristjan Järvi (Chandos). That was one of my top picks for 2009, which surely augurs well for this new release. First impressions are quite positive, Sado’s taut, muscular delivery backed up by sound of considerable weight and refinement. So, a fairly conventional Moderato, which suddenly feels a tad predictable after Urbański’s more restrained and illuminating one. Now, that was unexpected, but side-by-side reviews often produce surprising – even startling – results. Sado is suitably volatile when required, and the in-house recording is big and punchy, both of which should delight those who like their DSCH dished up this way. Others, in search of a subtext, won’t be so easily satisfied; Sado’s ‘straight’ treatment of the equivocal Allegretto is a case in point. True, his Largo isn’t without inwardness or a degree of insight, but again I was struck by how prosaic it all sounds after Urbański’s unsettling – even haunted – response to this extraordinary music. Given what’s gone before, Sado’s Allegro non troppo was destined to be exciting – and it is – but there’s little of Urbański’s coherence or powerful sense of shape and purpose. Then again, it’s all about an overall design that pays as much attention to the details as it does to the greater structure. Without such a plan, Sado’s Fifth never feels complete. That’s not the case with his Berlin performance, though, which seems more durable – and interesting – than this otherwise competent remake. Sado’s Suite for Variety Orchestra is certainly engaging, the jolly March especially so. This is fun stuff, full of wit and point, and these players, weaned on Suppé and the Strauss family, are very much at home here. The Lyric Waltz is nicely done, as is the Little Polka, but for some reason the numbers are presented out of sequence. That said, Dmitri Yablonsky and the Russian State SO, on Naxos, are in another league entirely. Remastered and reissued as a high-res download by 2xHD, their delectable dance-themed collection now sounds even better. The authentic ‘tang’ of those performances is a bonus. Two very different accounts of the Fifth; only one is a keeper, though.